We use this section to highlight events that are pertinent to a college-wide audience. We rotate through events from all campuses, and about a variety of topics. Each item points to its listing in the PCC event calendar or event page. The Web Team adds events to the page manually. There can be one or two events, or we can remove the section if there are no events to show. 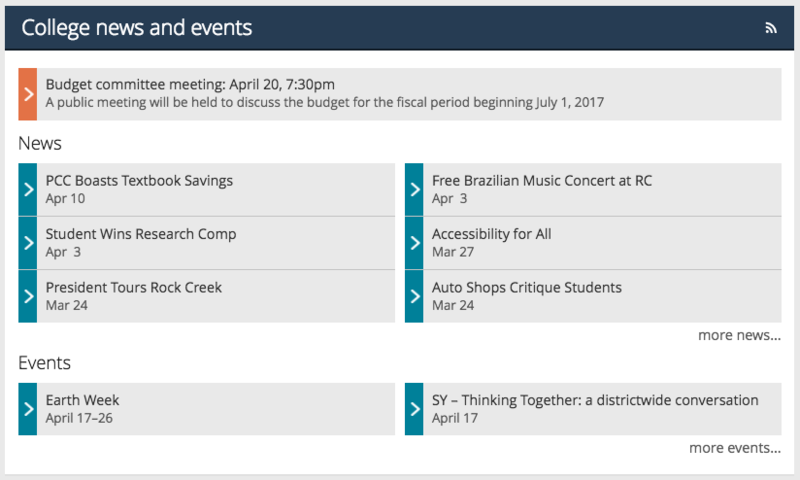 A “more events” link directs readers to the PCC event calendar. Each event includes the abbreviated campus location (or no location if it’s at multiple campuses), a short title, and the event date. We don’t include the time. The items display in two columns on large screens, and stack into a single column on small screens.